In our early post we compared all Philips Trimmers model with prices. But for a person who has never used a Philips Trimmer, the question always remains. How to use Philips trimmer? It may sound weird, but this question is very common. That is why we wanted to create a useful guide which will teach you how to use Philips trimmer and get a great beard style for yourself. In another post, we have covered what are the basic differences between a trimmer and shaver. To explain in a few words again, a shaver will help you attain a clean look while trimmer helps you maintain a beard. Now we will cover in easy steps how to use a Philips trimmer. Please note that these steps are not set in stone and some people might do it differently. The purpose of this post is to show you the features of the Philips trimmer rather than the actual steps to shave or trim your beard. Before using the Philips trimmer, it is important to understand the different settings on the Philips trimmer. Understanding of the settings will help you achieve a good trim of your beard. The blades on a Philips trimmer are very different from a shaver. A shaver usually has 1 or more blades which are parallel to the shaving head. 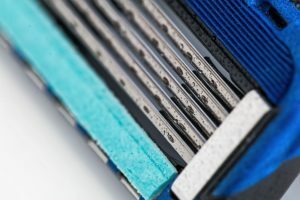 The blades do not move during the shaving process, only the head does. A trimmer is different. 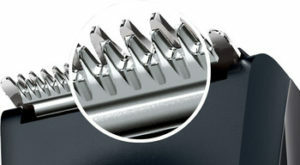 A trimmer has 2 blades which are installed in parallel. One blade is usually higher than the other. The blades consist of many peaks and troughs. During the use of the trimmer, the first blade does not move while the second moves rapidly in an back and forth motion. When the hair passes through the blades, the rapid motion chops the hair and this is how trimming is achieved. A Philips trimmer also comes with a comb attachment. A comb helps in managing the distance between the blades and the beard. This way, you can trim your beard but still leave hair depending on your style. Some people might like a light stubble while some people like a full thick beard. The Philips trimmer helps you get both the looks with the same trimmer. The height adjustment feature adjusts the distance between the blades and the hair. This way you can manage how thick the beard should be while trimming the rest off. Now that you have the basic understanding, let’s dive into the actual tutorial. 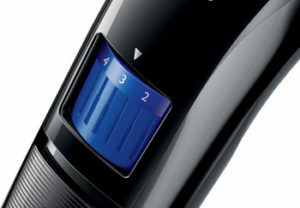 To use your Philips trimmer, you should use the following steps. As mentioned above, these are mere guidelines, its up to you how you want to use Philips trimmer. This is an obvious step. Most Philips trimmer are now chargeable and wireless. Only a few models are still corded. If you are using a wireless model, then it’s good to have a full charge on the trimmer. Different Philips trimmers have different charging times and you should charge your trimmer only as adviced. We have covered [charging times of Philips trimmers] in our old post. It ranges from 60 minutes to 10 hours for different models. This step is very different from shaving. While shaving its recommended that you wet your beard and make it moist. While trimming, you should not wet your beard. Instead, preparing your beard for trimming has nothing to do with moisture. It has to do with a comb. Yes, for best results especially if you have a thick beard, its recommended that you comb your beard gently with a fine comb. This will make sure that there is no tangles in your beard and you will experience a fine trim. This step has nothing to do with a dictionary. Defining your beard means defining the outlines of your beard. You need not worry about cuts as all Philips trimmers are equipped with a soft edged blades which do not cut your skin. In this step you adjust the height of the comb to match your beard style. A higher number on the height means the trimmer will leave a thicker beard behind while a smaller number means a more finer beard. Philips trimmers usually support a adjustment size of minimum 1 mm for entry level models and 0.5 mm on premium models. We also covered adjustment length in our previous post about [comparision of Philips trimmers]. You can check it out again for that information. Now you actually start trimming with the Philips trimmer. Use smooth, slow strokes to use the trimmer. If you are new to using a trimmer, you might need a few days to get used to the trimmer. During this time you might need to adjust the comb multiple times to understand how the beard looks on you. After you have trimmed the beard to your satisfaction, it is time to clean your Philips trimmer and store it. Cleaning can be done in 2 ways. Please note that your Philips trimmer might not be waterproof. You need to take the shaving head apart and only clean that under water. Philips trimmers come with a cleaning brush. You can use the brush to clean the hair around the blades. After you have cleaned your trimmer, you should let it dry for a while. When your trimmer is completely dry, you can store in the box or anywhere you like. Well, we hope now you understand how to use Philips trimmer completely. If not, please let us know in the comments. We respond to every single one. Or, if you have some awesome beard pictures of you, feel feel to share them as well.